Wishing every day could start off be as beautiful as this. Under the cherry blossoms. The only thing missing is you and the mister. You said it! 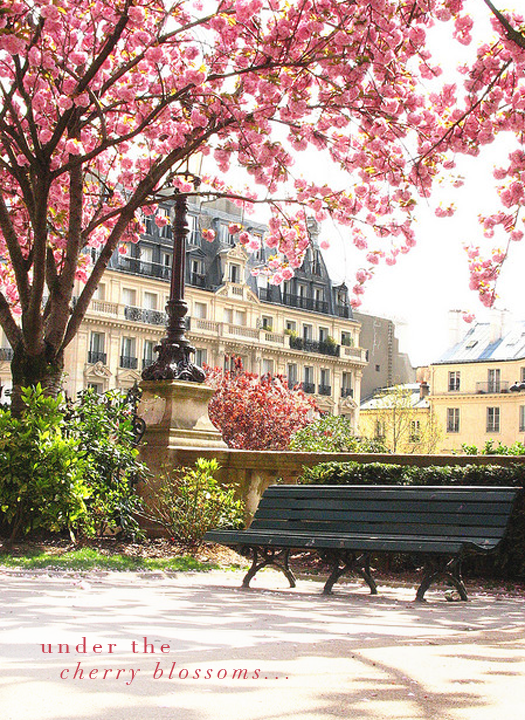 Not only do the cherry blossoms evoke Spring and Love, but what is clearly Paris evokes those images as well. What could be better than Spring in Paris with the one you love? Gorgeous! I love CHERRY BLOSSOMS! Hi! Just found your pretty blog through Pinterest. I grew up in Brooklyn and a long time ago there was a "Cinderella Project" to restore old brownstones. Is that where you got the name? Thanks for the cherry blossoms. I guess you've been to BBG in the spring. I used to go with my Mom! Great job..